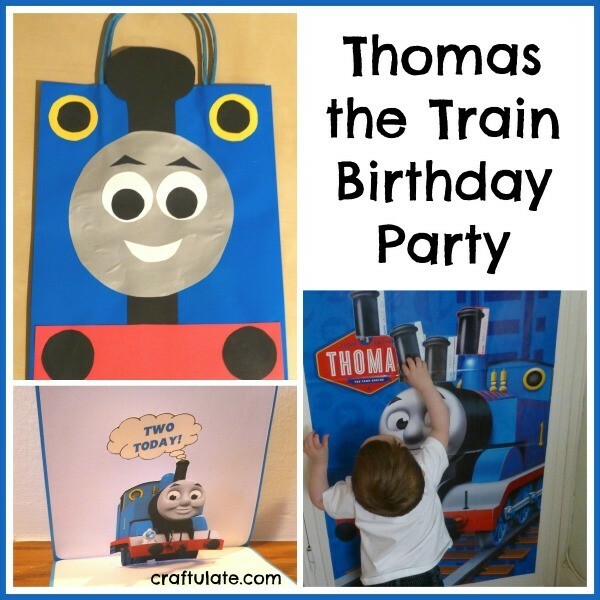 This Thomas the Train Birthday party was for my son’s second birthday, and included homemade invitations, party bags, and birthday card plus themed food and games! F has just turned 2 and we were visiting family in the UK at the time. This meant that we couldn’t throw a party for all his little friends back in the US, so we had a little mini train birthday party with two of his cousins instead. Even with such a small invitation list I just had to make invitations! The official Thomas & Friends font is bespoke, so I used a similar free one called “Flange BQ”. Then you can glue any image on to one side of the box, just check that when the card is closed the image does not extend beyond the card. This style of card creates a gap behind the box, so I usually add another piece of card behind it to form a front cover. In addition to banners and hanging garlands, we used silver tape to mark out a track shape on the front path and inside the house. I ordered F a custom shirt from JamieSewCute embroidered with his name, age and (of course) a Thomas logo. For the cake, my mother and I made a two layer sponge cake. 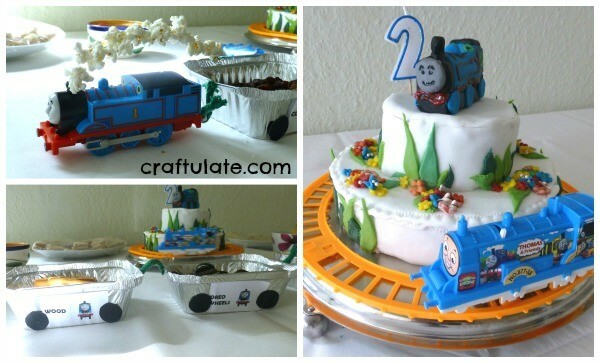 She covered it in icing while I made some leaves and an edible Thomas train for the top. Then around the base ran a little battery-powered Thomas train. We put a sticky wall collage up (similar to this one) and invited F and his cousins to add to it throughout the party. 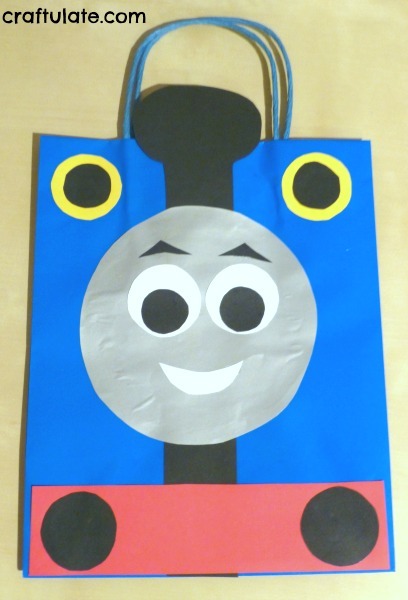 I used plain blue bags and glued on the details cut out from card and paper. For party favours we provided bubbles, whistles, toy cameras, and a print-out of a Thomas paper craft from Working Mom Cook Fusion. Having a small party is probably unusual, but perfect for F. He really enjoyed it and just couldn’t get enough of all the trains! 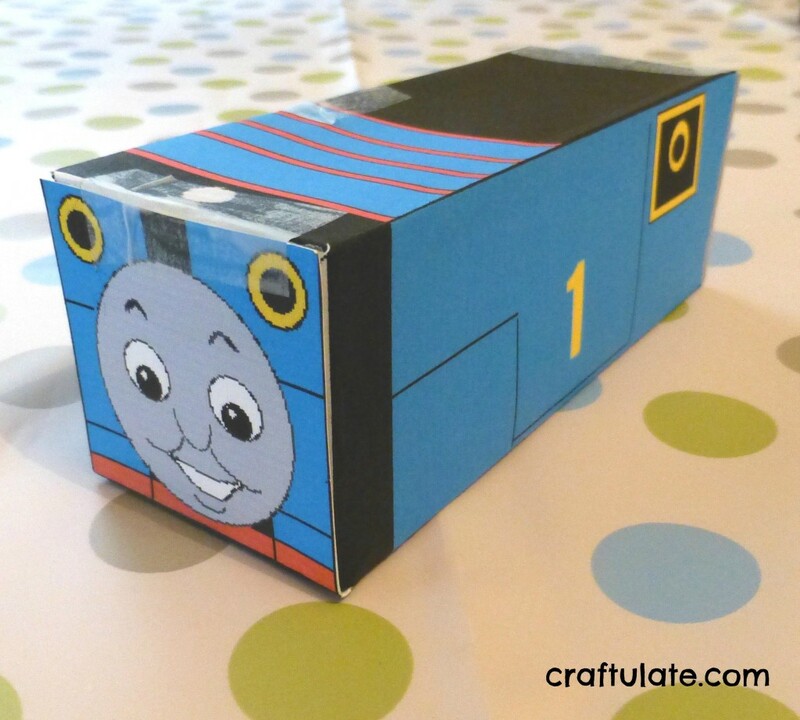 Oh and if you’re looking for train related crafts – here’s a homemade Table tent and a Thomas costume made from a cardboard box! 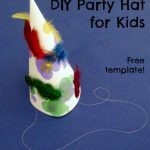 I love your party ideas! 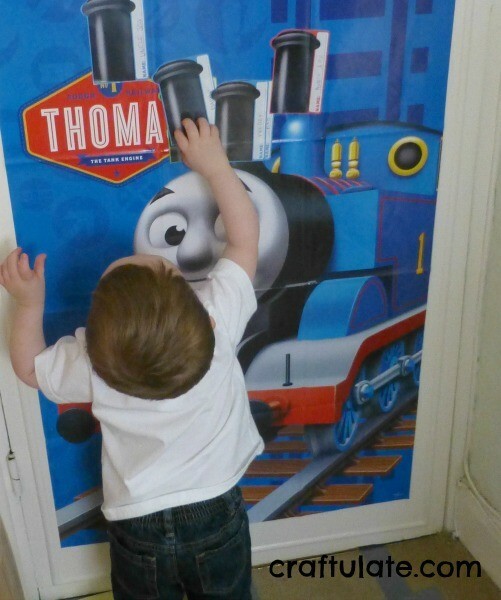 Where did you find the poster of Thomas for the Pin the Whistle on Thomas game? Thanks! 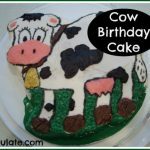 I got it from a party store I think, but you can get it from places like Thomas the Train Pin the Chimney Party Game – Birthday and Theme Party Supplies Amazon. I love this party! 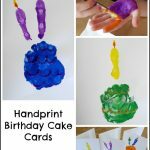 Planning my son a 1st bday party. What size was the pop up invitation? The invitation wasn’t pop-up – it was just printed onto cardstock. The birthday card was made from blank greeting cards I got from the craft store, I think they were 6×6″. I hope your son has a wonderful party!